Today the old man has announced his decision to retire from F1 driving at the end of this year. 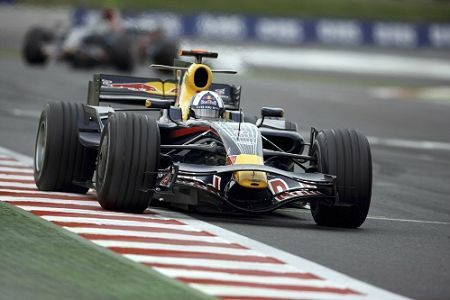 He will continue with the Red Bull team, however, as a consultant in the testing and development of their cars. This comes after several years of speculation regarding DC's retirement and it is somehow fitting that he should have made the final decision at a time when the media were not really expecting it. There remains only Barrichello of the "old guard" and, with Ross Brawn playing down the possibility of Alonso joining Honda next year, it looks quite possible that Rubens will soldier on. No doubt the media will be filled in the next few days with retrospectives on David's career and we will begin to appreciate that he will leave a considerable gap in the sport. He was never counted amongst the top flight of drivers, being regarded as more an honest, competent and dependable member of any team, the kind of driver who makes an excellent number two. That may be a little unkind, given his thirteen GP wins and the most points scored by a British driver, but these results are spread out over a long career of more than 200 F1 races. Had he concentrated them in fewer years, he would have received more benefit from them. When he first entered the sport, he struck me as a solid but unexciting driver, not a future champion but certainly worth his seat. He came close to proving me wrong on occasion, finishing second in the championship in 2001, but a combination of bad luck and very quick team mates prevented him from achieving that number one spot. Much is made of those few GPs he had to hand over to Hakkinen or Raikkonen, yet these were so few that they would have made little difference to his overall statistics. Over the years DC became a fixture, always good for some stirling drives and outspoken comments, a valuable member of his teams through hard work and development ability, a spokesman for the GPDA who was not afraid to point out where he felt the FIA were going wrong. Indeed, it was the FIA that may have have handicapped DC most effectively with their introduction of one-lap banzai qualifying just at the time when he was at the top of his game. DC never liked the system and far too many of his races were compromised from the start by poor grid positions. But the man could race and we became accustomed to watching his climb through the field in GP after GP. In the last two seasons he has been outpaced in the Red Bull team by Mark Webber but DC's enthusiasm for the sport never wavered. And this is the real measure of his achievement, that he loves racing and the dedication it requires. At the age of 37, that requires an amazing resilience and determination. As a man, DC has never been a number two. From the sound of David's plans for the future, it appears that his position with Red Bull will include a good deal of test driving. I hope that is true, for he loved driving and still has valuable contributions to make. There are rumors that he may also become a commentator for TV broadcasting but I feel that would be a waste of his talents. Martin Brundle has made that field his own and DC might struggle to compete. But whatever happens, DC will be missed as a driver. No doubt the rumor machine will be suggesting all sorts of names as possible replacements but the truth is that the team will not find quite the same combination of speed and experience again. It's no wonder that they chose to keep him as a consultant. DC has always been one of my favorite drivers. He just seemed to fulfill my idea of what a driver should be. I was, however, disapointed in his farewell statement. He thanked everyone under the sun...including Bernie...but not his fans. I find that odd. Man, the words really loves you. The best statement about DC retirement I have ever read so far. You pointed all reasons why David deserves our admiration, mainly his integrity and braveness to say whatever he wants. Just for that, thanks David. I think DC is a real nice guy, a true character of the sport but honestly, very few drivers have done so little with such top notch equipment over a career. In my mind he will always be a #2 or "B" driver. DC's career could have been a lot different if he had not signed IMG to manage him. They were responsible for his move to McLaren for 96 and the failed attempt at the same move a year earlier. Had they been more interested in getting him into or keeping him in a competitive drive rather than a better paying drive he could have had Damon Hill as his team mate for 1996 and 1997 and had a championship winning Williams at his disposal. Taking a championship from Damon would have been different to taking one of Hakkinen. Thank you, Becken - and your memory of DC is another excellent reminder of his character and occasional bluntness. F1 will certainly miss him for that. As for DC's omission of the fans from his thanks, I can only presume that it was an oversight. David was usually very good at remembering his fans and it does seem strange that he should have made such a mistake at the last. Aj's point is one that we all feel to some extent, I think, but would probably have different thoughts id Steven's suggested alternative had happened. Damon was gritty and determined too but was not as talented as DC, I think. Sad news, but not entirely unexpected I suppose. As I type I look at the poster of DC winning the 2003 Oz GP which is on my desk, and remininsce about what a fantastic race that was, and what a great driver & personality DC has been over the years. I guess we still have a few more rounds yet to see him, but already it feels a bit like the end of an era. There's a part of me that hopes he becomes Dario Franchitti's teammate in Nascar. More realistically, maybe he'll do some sportscar races. So, not America - but it wouldn't surprise me in the slightest if we see him in the 24 Hours of Le Mans one day... or maybe in DTM for Mercedes, trolling around near the back in a year-old car and having fun. Great retrospective on his career - honest about his weaknesses and good on his strengths. I enjoyed reading it a lot. DC didn't seem keen on NASCAR after having a look at it earlier this year. I think we'll see him in a few sportscar and Le Mans type races in future but not season-long.